From our site visit yesterday, Oakwood House is well on schedule to meet the completion date of the end of this month (September 2017). All construction has now been completed, alongside the bathrooms and communal kitchen areas. The carpet was fitted throughout the development yesterday, meaning they are now awaiting on the arrival of the bespoke furniture packs, which are due to be delivered the beginning of next week. Once the furniture packs have been delivered and fitted, Oakwood House will be ready for completion. 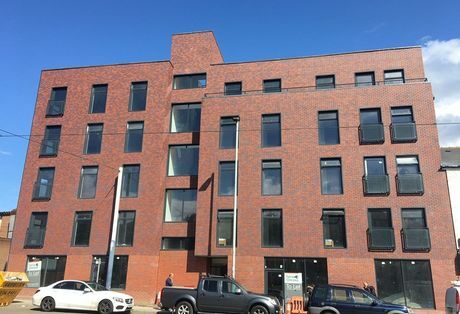 Oakwood House is a renovation development perfectly situated in the heart of Sheffield, making it the perfect development for students attending both Sheffield Hallam and The University of Sheffield. Oakwood House will comprise of 102 ensuite apartments which are set in four, five or six clusters. Each cluster has a communal area which features a fitted kitchen, dining and living area. Invest from £59,950 per studio apartment and generate an assured 8% net rental per annum. If you would like more information on Oakwood House, call +44 (0) 161 337 3890 or email enquiries@hopwoodhouse.com to speak to a member of our consultants’ team.